Celebrating New Year's Eve at a bar or club is good way to steer clear of all the work usually involved with this big evening. So if you are planning a New Year’s Eve on the town, there are a few things that you should consider beforehand. One of the first things you should decide upon is whom you would like to celebrate New Years with. Put together a list of friends and family who you think would enjoy going out, and then contact them to determine their availability. Many may not want to go out to a bar on New Years, so be prepared for the possibility of a small entourage. The size of your group is less important when going out; expect throngs of people at your destination. It is important to come to a consensus with those accompanying you on the type of establishment and atmosphere desired. Finding the right location to bring in the New Year at can be a difficult task. Obviously the internet is a logical place to look, but also consider your local news papers. The free weeklies are especially full of such advertising. Many popular local clubs have their own web sites, so check back often with them for their latest announcements. 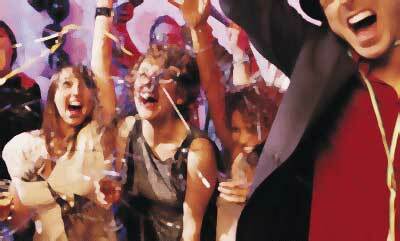 Most establishments charge an entrance fee on New Years that can vary in price. It is important that you decide upon a budget for the evening that will cover all expenses including drinks and the cost of a taxi for the ride home. Many clubs offer $100 - $200 entrance tickets that include an open bar. This is often a good way to save money; but not always. It is sometimes difficult getting drinks at such events due to overcrowding. Often wait times for drinks can exceed 30 minute each and every time. Also, these open bars sometimes expire at midnight, leaving you with little or no options if you didn’t bring additional money. Tickets for these New Year’s parties usually go on sale months before, so act fast and reserve before they sell out. New Years is a time of joy and renewal, so be careful and don’t over do it. If you or your companions have been drinking, please don’t drive. You would not want this New Years to be memorable for all the wrong reasons. New Year’s Eve is a difficult night to find a taxi, so try to make other arrangements if possible.